Dedicated to American writers both past and present, the Chicago museum is the first of its kind in the nation. 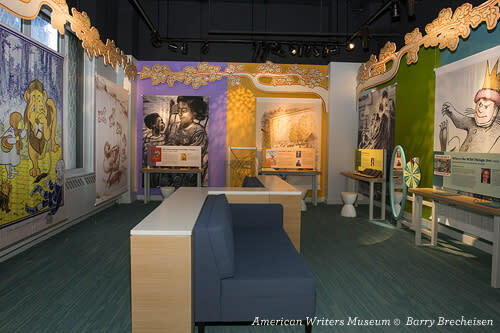 The hotly anticipated American Writers Museum opened its doors in Chicago on May 16, 2017, to the delight of bookworms everywhere. It takes its place on Chicago’s Cultural Mile alongside other esteemed institutions that include the Art Institute of Chicago and the Chicago Cultural Center. 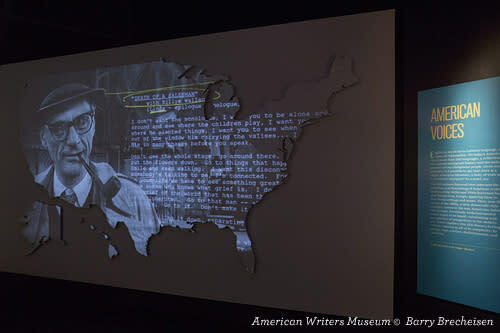 But for lovers of the written word, the American Writers Museum should be the first stop on a trip through Chicago’s cultural playground. 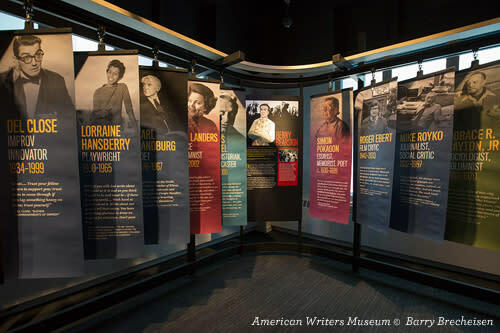 The American Writers Museum worked closely with 65 authors’ homes and museums around the country in order to capture their unique stories. The result is a lively, interactive showcase that shares the personal tales and literary works of some of America’s best-loved writers, ranging from Mark Twain to Dr. Seuss. Multiple galleries have been designed to engage and spur the imaginations of visitors of all ages. The museum’s sense of playfulness and purpose is evident immediately upon entering, with the branches of a tree above the entryway formed by rows of hardcover books. Grab one of the free bookmarks at the admission desk, which promote the many authors’ museums around the U.S. that were integral in helping to create the American Writers Museum. Unsurprisingly, there are stocked bookshelves and cozy reading nooks everywhere. In the brightly colored Children’s Literature Gallery, couches encourage young ones to plop down and lose themselves in Charlotte’s Web or the poetry of Langston Hughes. In the dramatic Writers Hall, 100 authors are highlighted on one wall, while 100 literary works are showcased on the other. Slide one of the small illuminated wall boxes and you’ll learn about the key element from a famous story or read a quote from an iconic writer. In the Nation of Writers gallery, discover authors who convey a unique American voice across mediums that range from poetry to sports writing. A mesmerizing video installation called Word Waterfall spotlights animated quotations set against a backdrop of dense text. The Mind of a Writer gallery demystifies famed writers’ works and reveals the methodology behind their craft. Visitors are invited to explore their own inner voice with fun games, or they can pound out an inspired short story on one of the vintage typewriters. The Wintrust Chicago Gallery pays homage to the writers and influencers who shaped the Windy City’s dynamic literary tradition. Spend some time and learn the stories behind Chicago icons like poet Gwendolyn Brooks and newspaper columnist Mike Royko. The Readers Hall will host author readings, talks, film screenings and family-friendly workshops. The American Writers Museum is located on the 2nd floor of 180 N. Michigan Ave. Hours are Tues., Wed., Fri., Sat., Sun. 10am-5pm; Thurs. 10am-8pm; closed Mon. Tickets are $12 adults; $8 seniors and students; children ages 12 and under free. Final ticket sales are 30 minutes before closing. Phone 312-374-8790 for more information.